Want to learn to draw? This free, hands-on tutorial will walk you through the basics of a professional drawing practice in about 15 minutes. Grab a pencil and paper and follow along! Just pick your settings and hit the "get drawing" button to begin. Gesture drawing is a commonly used exercise to prepare your brain to see the "important" parts of a pose, and prevent you from getting bogged down in the details. Thus, it's a very popular warm up before a drawing practice, and commonly used in university drawing courses to teach students good practice habits. We'll start there too. We're going to start with the "line of action" exercise. Whether from life or from imagination, the first mark made in most figure drawings is the line of action. You can start by thinking of the line of action as an imaginary line that runs down the spine. It is meant as the simplest possible description of a figure's main curve and force. The more curve you put into that line, the more attitude, force and/or movement the image will communicate. Some artists make two lines of action -- one for the body, and one for the arms. 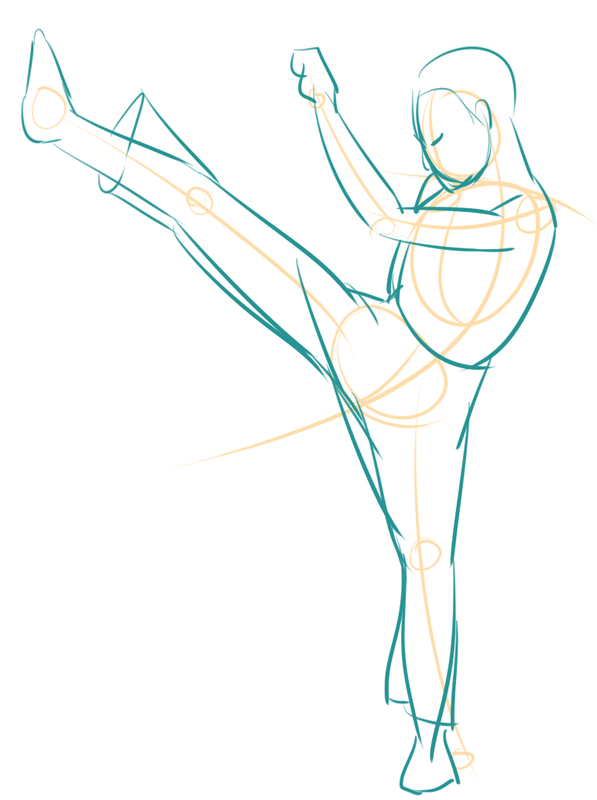 Eventually, you should be able to identify and draw the line of action within five seconds of seeing a pose for the first time. However, if this is your first time doing this exercise, allow yourself up to 30 seconds to examine a pose and make a decision about what shape its line of action might be. 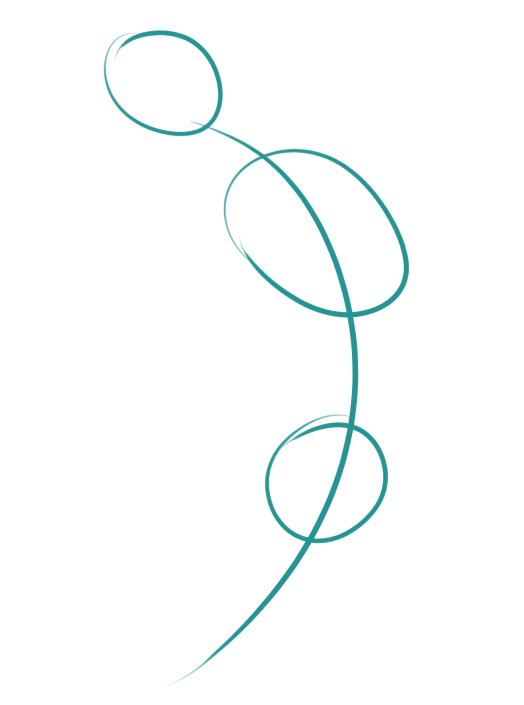 Try to make curves, not S-shapes or squiggles. Once you can recognize the line of action in 30 seconds, try speeding up -- see if you can identify it and put it down on your paper in 15 seconds, 10 seconds, or even 5 seconds! Remember, you only need to identify and record a single line to successfully complete this exercise. Why do this exercise? This exercise teaches your brain to see the figure as a whole, rapidly identify the essential essence of what makes a pose interesting, and sets you up to be a strong visual communicator. Once you have established the line of action, it becomes easier to compose dynamic, expressive poses by "hanging" the head, ribcage and hips along this line. These are the "three movable masses" that compose the main trunk of the human body. Even if you're just starting out, give yourself no more than 1 minute for this exercise -- find the line of action as quickly as possible, and then place your three movable masses along it. If you have extra time, you can always add more to your drawing, but that's not required right now. Again, gradually speed up this exercise until you find you can identify the line of action and place the 3 movable masses in 60 seconds, 45 seconds, 30 seconds, maybe even 15 seconds! 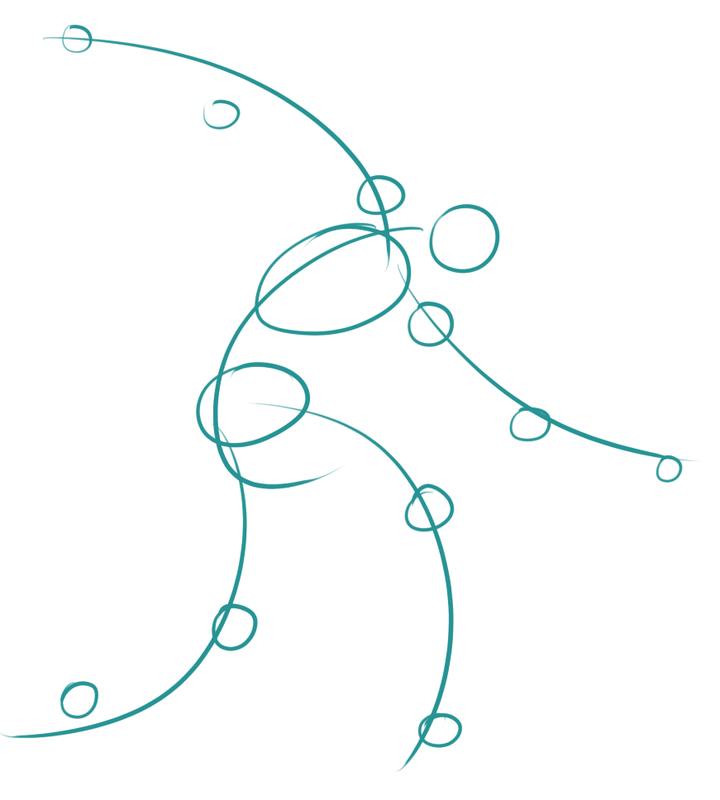 Many new artists are concerned when their short exercises don't look like much but lines and bubbles. This is a setup for disappointment and failure! Remember, these are exercises, not completed drawings. If you were learning to dance, you'd start every practice with physical conditioning like push-ups, and not worry that a push-up does not look like a dance. It's the same idea here. Now, when you've completed the line of action and the head, rib cage and pelvis, add either lines or long ovals to capture the limbs. Give yourself no more than two minutes to capture the line of action, the three movable masses, the limbs and the joint locations. Take special note of the major joints in the body like the shoulder, elbow, wrist, hip socket, knees and ankles -- you may wish to add a dot or a bubble to indicate where these joints are. These are the attachment and pivot points for your limbs. Remember: If you have extra time, you can add more to your drawing, but that's not required right now. "Under drawings" like these can become the basis on which you draw longer, finished artworks, giving you clues about the whole figure even as you start to focus in on details. Or, they can remain stand-alone exercises. A few tips: Avoid over-focusing on details. In the time it takes you to draw one eye, you might also be able to get down an entire edge of the body that tells a better story about the complete pose. Give yourself room to work! You may want to take up a full page with your longer drawings. If you like, you can try to make beautiful artworks. But you will learn more right now if you treat your practice sessions as making visual notes about what shapes you think the body is made of and contains. We recommend you write today's date and the length of time you just spent on that drawing on your sketch, so you can see your improvement over time. Our "class-mode" will take you through short poses to warm you up, then gradually introduce longer poses, following the format of university figure study classes.